Yesterday the girls and I kick started the week by paying our local Pizza Express a visit after school with some friends. The occasion? To celebrate the arrival of the new film Ice Age Collision Course in cinemas next week! This month, Sid and his Ice Age friends have taken over the Piccolo menu and all kiddos get a fun packed Ice Age Collision Course activity sheet when they order their food. There's also a chance to win a trip to Hollywood by drawing a picture of your favourite character from the film with their favourite Pizza Express pizza! We arrived at the Haslemere restaurant a little before 5, which is our favourite time to dine. The restaurant is always a little quieter then, and it means that we'll usually have eaten by about 6 and can still get home for the usual bedtime routine, although on this occasion the girls were having so much fun that we completely lost track of time and it was almost 7.30 when we eventually left. 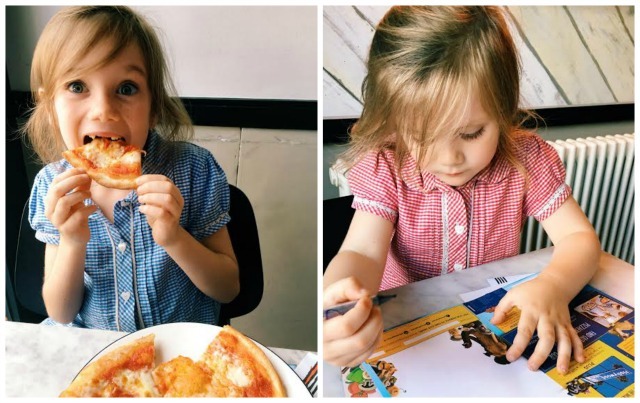 It goes to show that when you're in a family friendly restaurant like Pizza Express, you really can relax and enjoy yourself - plus those brand spanking new activity sheets were extra entertaining! As always the girls and their friend ordered from the piccolo menu; doughballs and veggies to start, and pizzas for all as their main. I went for the classic Italian antipasto as my starter and my friend chose the bruschetta, and then we both had padana pizzas for our main, although my friend was good and went for the leggera version, while I had the full pizza on a huge romana base! Ahhhh dessert! My favourite course. Us grown ups were kind to the kiddos and let them order from the grown ups menu, while we ate their little piccolo brownies. Daisy went for the honeycomb cream slice, Evie the new passionate mess, and their friend the chocolate fudge cake. Turns out we were rewarded for our selflessness as they couldn't manage the huge portions and we got to sample them all! 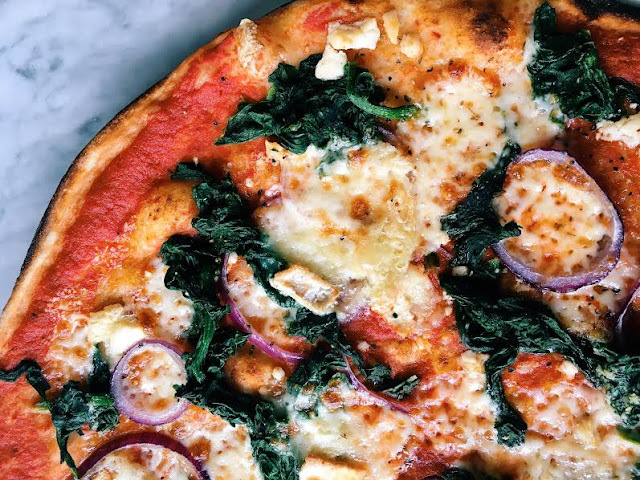 We had a truly lovely meal; Pizza Express really does tick all the boxes for me when it comes to dining out with children. The activity sheets are brilliant for keeping them entertained while they are waiting for their food and these new Ice Age themed ones were a real hit! I also think the Piccolo menu is also great value for money. 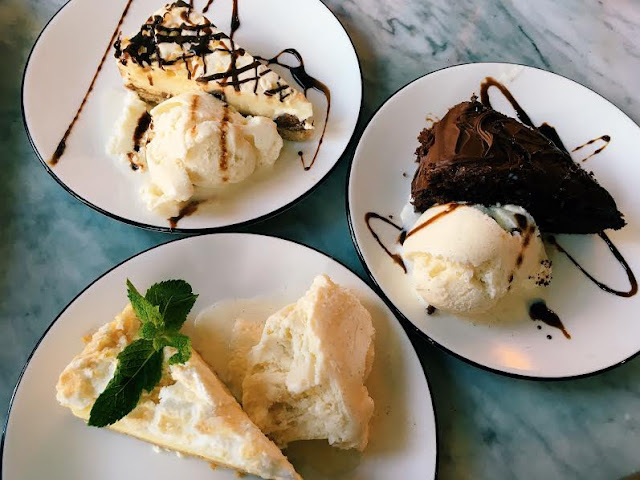 At just £6.50 for three delicious courses and a bambinoccino (or one course for £3.95 if they only have a little appetite - or want to save room for a grown up size portion of dessert), you really can't go wrong. Visit the Pizza Express website here to find out more about the partnership with Ice Age and for further details on the chance to win that trip to Hollywood. Ice Age Collision Course is out in cinemas on 15th July - we can't wait to see it!